This article explains ACCESS Model in a practical way. After reading you will understand the basics of this powerful social media tool. Lon Safko and David Brake describe the ACCESS Model in their book The Social Media Bible (2012)– tactics, strategies and tools for business success. 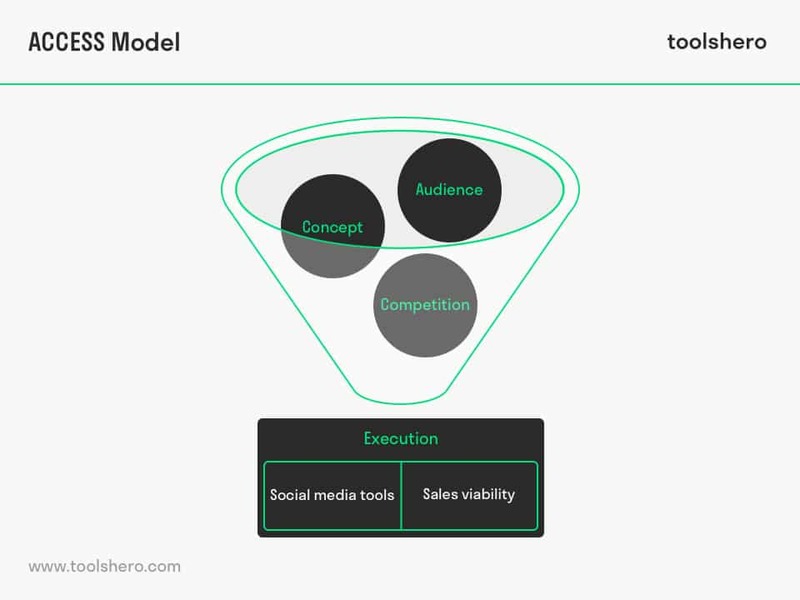 The model can be described as a guideline for setting up and implementing a Social Media Strategy. The acronym ACCESS stands for Audience, Concept, Competition, Execution, Social Media and Sales Viability. Knowing what your audience is doing is crucial, when it comes to Social Media. What are the main characteristics of your audience? Get to know them by taking surveys, interviews and by creating persona’s to recognize your target audience and to know how to serve them best. Define the concept you want to use when serving your audience. This concept goes with your organization, product, service or brand. Create it and verify it in your target customer group. Analyze your competitors’ online activities. Don’t focus on the tools they use, but on the purpose it serves and how their customers and prospects are using it. Reach outside your common environment, and try to compare with similar international companies. The execution phase is a one way street of ‘just doing it’. But before you start, it is rather important to make a careful plan of what comes next and how to start your Social Media strategy; when to use what content? Customer feedback can make the difference in this phase. Content or concepts that are picked up by customers can be further developed and others get less priority. What tools are available for your online target audience? How can they be used? And how do you get this group to the place where they can contribute and give feedback to your concepts? Eventually, it is about the return on investment (ROI). How to best create value using a Social Media approach? What is the initial duration of the project and when is the time to revise? Define success and failure and the method of measurement. Be open to change. Safko, L. (2012). The Social Media Bible: Tactics, Tools, and Strategies for Business Success Paperback. Wiley.